Our speed training timer is a great tool for obtaining accurate and consistent times for common football drills like the 40 yard dash, pro agility shuttle, and the three-cone drill. 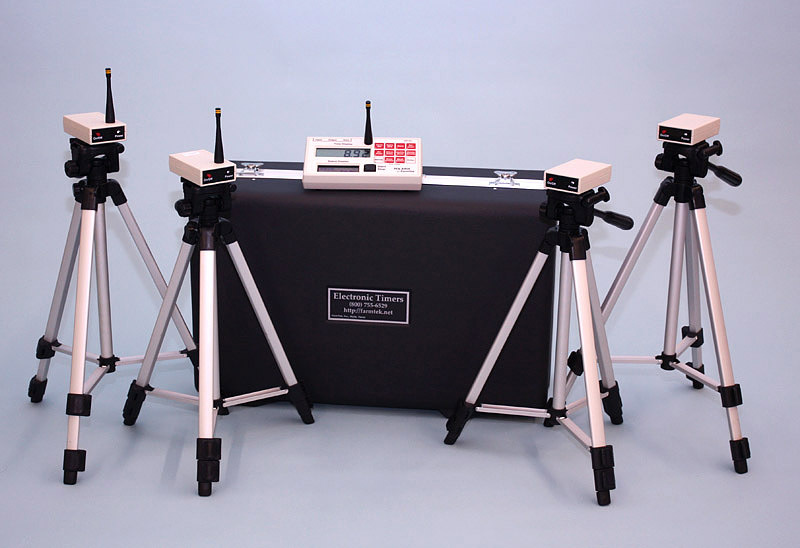 It is also useful for timing speed drills for baseball, hockey, track and other sporting events. The electronic timer eliminates the human error and bias that so often result in times that don't accurately reflect the athlete's actual ability or progress. No cabling or power connections required. 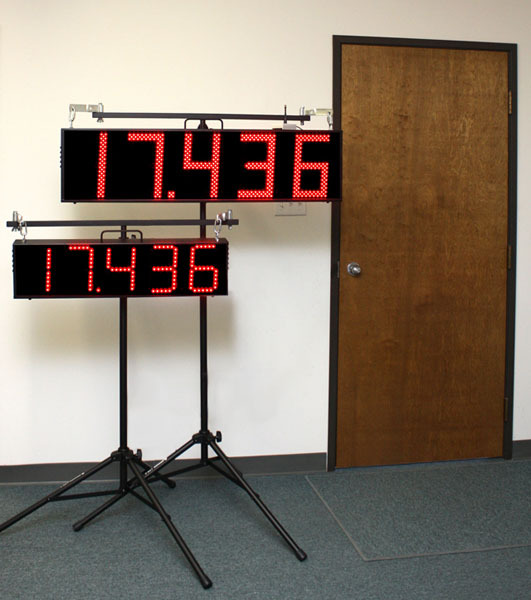 Hands free timing eliminates human error and bias. The timer can start when the start line beam is broken (runner starts behind the beam), or when the start line beam is restored (runner starts in the beam). With additional electric eyes, up to two split times (e.g., 10 yard and 20 yard) can be timed. The timer also supports manual start with an electric eye finish and vice-versa. When hand starting the timer, the unused start-line electric eye can be used as a split time eye. The optional wireless handswitch can be used to manually start or stop the timer, or to control arming of the timer to give the coach more control over timer activity in crowded situations. Events like the pro agility shuttle and three cone drill are automatically timed – including the process of ignoring intermediate beam breaks. An optional horn can sound when the timer starts or stops. For example, manually start the timer and automatically sound the horn at the same instant for start-block training. Set up and tear down in just minutes. 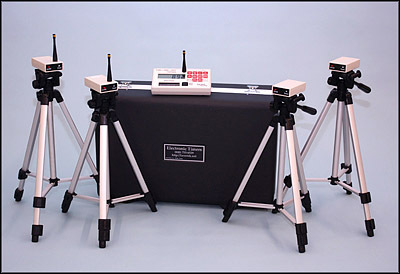 All equipment shown, including tripods, fits inside a custom made carrying case. Spectator displays and a computer interface cable are available separately. See our speed training equipment in action! Includes the Polaris timing console, two pairs of electric eyes (start pair, finish pair), four tripods, a custom hard-shell carrying case, and batteries for all equipment. Includes the 7 inch LED scoreboard and 50 feet of cable to connect the Polaris console to the scoreboard. Includes the 10 Inch LED scoreboard and 100 feet of cable to connect the Polaris console to the scoreboard. When there is not a good location from which the scoreboard can be hung, the scoreboard stand is a great way to increase the visibility of either of our LED scoreboards. Extends up to nine feet in height, collapses to about 57 inches. Note: Guy-wires and/or bagging are required for windy conditions. The wireless handswitch can be used to remotely start and stop the timer by hand, or to manually arm the timer to give the coach more control over timer activity in crowded situations. *Note: Our tripods are standard camera tripods and may be replaced with a make and model found at your local department store.